It's not a concept, and it's actually for sale. 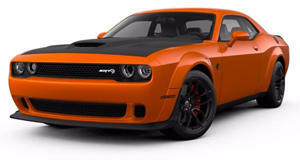 Last year, we heard that some ambitious owner commissioned his dealership to build him a convertible Dodge Challenger Hellcat. We really liked the idea of a convertible Challenger Hellcat, but the nearly $140,000 price tag was a bit steep for a $62,000 car with its roof removed. We know that turning a car into a convertible without completely ruining it is not cheap, but we have seen some incredible creations like a Ford F-150 convertible that aren't insanely priced. Luckily, we found another convertible Hellcat, but it isn't exactly cheap either. The car that we found is a 2016 Challenger Hellcat built by Drop Top Customs in Florida. The car is painted in Plum Crazy Purple with what appears to be a custom white leather interior. The car is currently being offered by Vero Beach Chrysler, Jeep, Dodge Ram for an asking price of $89,999. This is a fair bit more than a base Hellcat's $62,500 base price, but we're sure that a lot of work has been done to ensure that this car wasn't ruined when the roof structure was completely sliced off. There aren't any pictures of the car with the roof up, unfortunately, but the roof mechanism is fully powered for maximum ease and comfort. When it rains, owners won't have to worry about the elements getting in. The color combination is also very unique. The purple and white is one of the best that we have seen on a Hellcat, and Plum Crazy Purple was on our list of the coolest colors from Dodge. We don't care for the chrome Cragar wheels, but that's an easy change. The real question is why someone would want to have a Hellcat convertible? We have dreamed of the day when Dodge would revive the Magnum and build a Hellcat Wagon, but we really love the idea of a convertible Hellcat as well. Turning a car into a convertible is an easy way to make it heavier, but the 4,448-pound Hellcat wasn't exactly a lightweight to begin with, hence why we think that it is an appropriate car to turn into a convertible. The Hellcat is very fast in a straight line, but it can't keep up with more focused cars like the Corvette Z06 on the track. A convertible Hellcat allows people who simply want a powerful muscle car to enjoy their drive on main roads. The Hellcat isn't really made for the track, so this convertible version would be perfect for cruising when the weather is nice. The company that built this car will even do a convertible version of the Charger, so it could potentially build a Charger Hellcat convertible. This would be extremely unique because no manufacturer currently builds a four-door convertible unless we count the Jeep Wrangler, which we won't. Back in the 1970s, Dodge did build a convertible Challenger, although it hasn't built one since the model was revived in 2008. There was also a convertible Plymouth Cuda, and we have heard rumors that the Cuda could be revived as a smaller version of the Challenger with a convertible model. Until this happens, this convertible Challenger Hellcat might be the only way to enjoy over 700 horsepower without a roof for less than six figures. There are tuned cars with this level of power, but we still think this Hellcat convertible is a unique car.